Logs indicate that a computer on the 2001:DB8:1:11::0/64 network is repeatedly refreshing their web page causing a Denial-of-Service (DoS) attack against Server3. Until the client can be identified and cleaned, you must block HTTP and HTTPS access to that network with an access list. Step 1: Configure an ACL that will block HTTP and HTTPS access. Configure an ACL named BLOCK_HTTP on R1 with the following statements. a. Block HTTP and HTTPS traffic from reaching Server3. b. Allow all other IPv6 traffic to pass. Step 2: Apply the ACL to the correct interface. Apply the ACL on the interface closest the source of the traffic to be blocked. Step 3: Verify the ACL implementation. · Open the web browser of PC1 to http:// 2001:DB8:1:30::30 or https://2001:DB8:1:30::30. The website should appear. · Ping from PC2 to 2001:DB8:1:30::30. The ping should be successful. The logs now indicate that your server is receiving pings from many different IPv6 addresses in a Distributed Denial of Service (DDoS) attack. You must filter ICMP ping requests to your server. Step 1: Create an access list to block ICMP. a. Block all ICMP traffic from any hosts to any destination. In this case, ICMP traffic can come from any source. 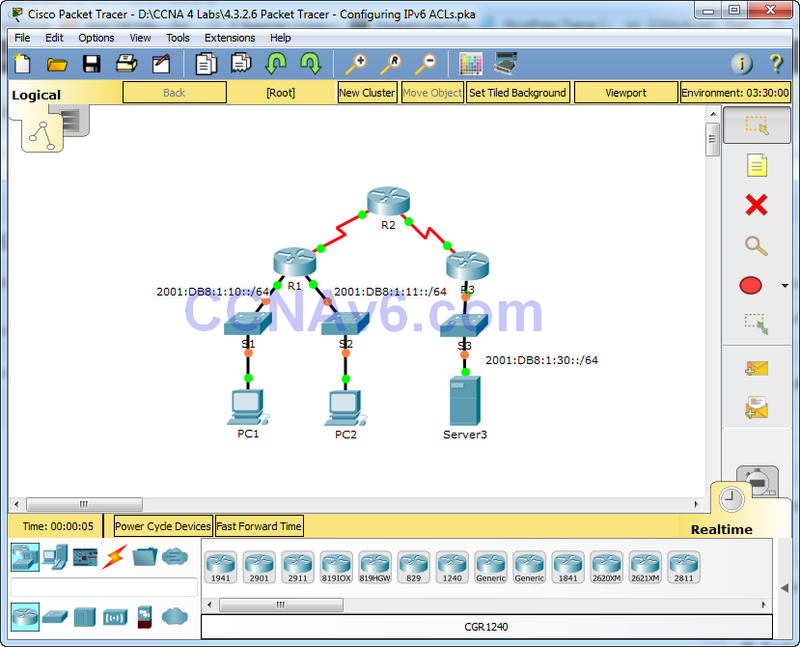 To ensure that ICMP traffic is blocked regardless of its source or changes that occur to the network topology, apply the ACL closest to the destination. Step 3: Verify that the proper access list functions. a. Ping from PC2 to 2001:DB8:1:30::30. The ping should fail. b. Ping from PC1 to 2001:DB8:1:30::30. The ping should fail. Open the web browser of PC1 to http:// 2001:DB8:1:30::30 or https://2001:DB8:1:30::30. The website should display.